OK, weighing in on the chemtrails issue. For some, the very existence of chemtrails is a tinfoil-hat conspiracy theory that has large forces of government, giant corporations, and other such dark (often secret) forces, acting in collusion to control the weather and even to control countries and their populations. The most visible "evidence" cited are persistent contrails (often in crosshatch patterns) left in the sky. These chemtrails (chemical contrails) are not composed of the vaporous exhaust of airplane engines, but intentional injection of chemicals into the stratosphere. The supposed purposes of laying chemtrails range from global weather control, international warfare, or world depopulation initiatives. All of this in secret without any oversight or control by the affected populations. Oh my. For a while the chemtrails theory seemed to call out for skeptical distancing on my part. My worldview accommodates some fundamental craziness in everyone so I'd tolerate my "rational" friends going off on chemtrail tangents from time to time. I did watch some very carefully made and "reasonable" documentary efforts on contrails, particularly "What in the world are they spraying," and its sequel, "Why in the world are they spraying." (Both are available online.) But the idea that the government, or some giant corporation in collusion with the government (the "Monsanto Model") would be able to get away with spraying crap into the air seemed unlikely to me. On February 14, 2013, NASA scientist Riley Duren gave a presentation on geoengineering. It was a very interesting talk about controlling the weather. He very plainly discusses the precise methods of laying chemtrails, and their costs and purposes. He didn't say anyone was actually laying chemtrails, but that it was an inevitability! Holy crap! The entire broadcast is still available. I made an 8 minute edit which excerpts the parts concerning chemtrails. Does this prove chemtrails exist? Not necessarily, but it shows that NASA (and many others) know how to make them and know that they can be "weaponized" for global control and giant profit. Would a corporation be able to get away with it? And why do chemtrails? Here's a scenario. In 2013, Monsanto purchased Climate Corporation for $930 million. That's almost a billion dollars. What does Climate Corporation do? It underwrites weather insurance for farmers. So if you underwrite bets on weather, being able to control the weather or even influence it the tiniest bit could pay off big time. That people on the ground may suffer unpredictable flooding or drought might stop Monsanto, though. Not. In the presentation, Duren gives the hypothetical cost of a global chemtrail campaign at $10 billion a year. That's a steep price even for Monsanto though, with a total capitalized value of around $20 billion. But how about a really gigantic corporation like BASF? They're the biggest GMO/pesticide/chemical corporation on Earth with a capitalized value of around $87 billion, and revenue last year of around $100 billion. But wait. In an article cited by Duren, the RRN Team of the World Economic Forum states, "Recent studies suggest that a small fleet of aircraft could inject a million tonnes of sulphur compounds into the stratosphere – enough to offset roughly half of the global warming experienced to date – for US$ 1 billion-US$ 2 billion annually." That's an order of magnitude less than Duren's estimate, and that much more doable. So, up in the sky. Is that a contrail or a chemtrail? 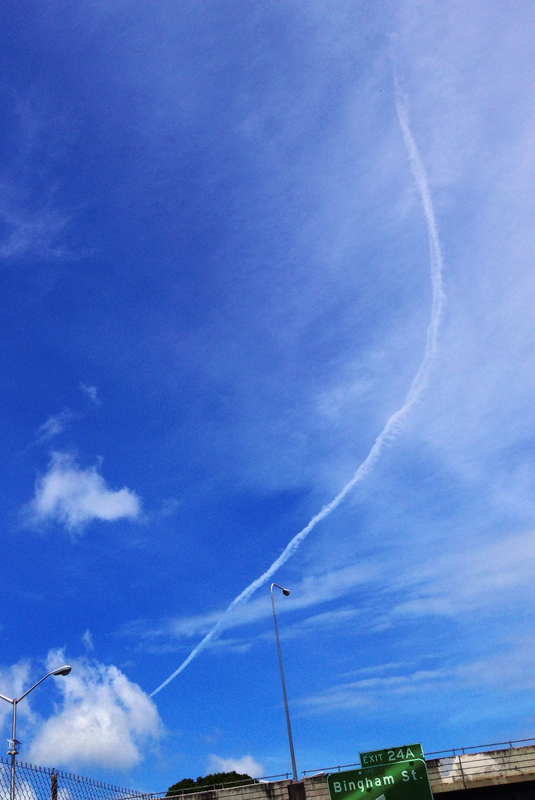 Well, it certainly could be a chemtrail, couldn't it? But if it were, we the people would be informed about it, right? Our government wouldn't let harmful chemicals be injected into our skies without telling us, right? We'd have to have informed consent to allow chemicals to be sprayed into the atmosphere, right? Especially if those chemicals might have unpredictable effects on our health, the weather, or that might unfairly profit huge corporations at our expense, right? They would have to disclose what chemicals they are spraying and observe some kind of buffer zone, right? World Economic Forum: Are we at risk from rogue geoengineering?